We’re happy to announce that the revamped Developer Tools area of addons.mozilla.org has just launched, bringing in many bugfixes and improvements, as well as support for our new review process. An entirely new design provides easier access to commonly used features, such as updating compatibility information, and much better interactions for add-on submission and management. The new review process ensures all add-ons hosted on AMO are safe, while still allowing developers to distribute their experimental work and receive feedback. Our add-on validator is much smarter than before and will provide helpful analysis to developers and editors. We want the thousands of add-ons available in our gallery to be safe for users to install, so early last year we set out to find a solution to the thousands of unreviewed add-ons living in our “sandbox”. We wanted add-ons to be reviewed in a way that would also allow developers to upload and distribute their work quickly in order to receive feedback from our community of add-on fans always looking to try new things. After several proposals and discussions with add-on developers, we came up with the concept of preliminary review, which is a lighter review that only checks for security issues. These reviews are much faster than full reviews and may still contain functional bugs and policy violations, but should be safe to use. Developers will now be able to choose a review process at submission, and while they’re waiting for review, can blog or share the direct link to their add-on. Anyone interested in learning more about the new review process should read our updated Review Process Policy page. Authors of add-ons currently in the sandbox will receive an email next week with instructions on how to continue hosting their add-on in our gallery. 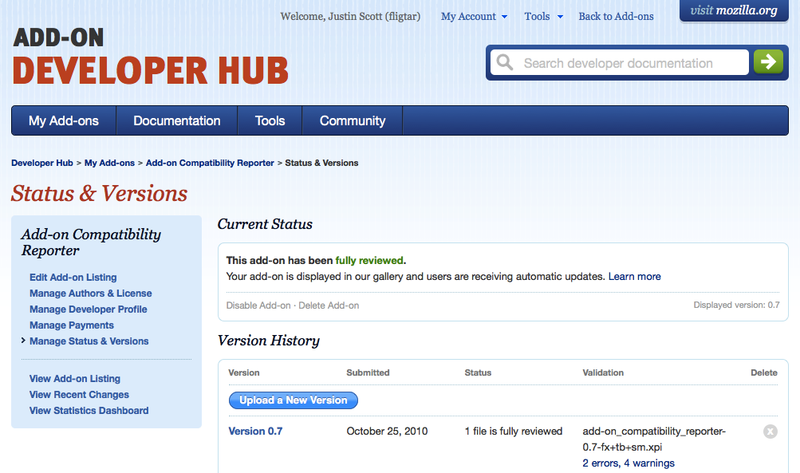 The only change authors of “public” add-ons should see is that they are now called “fully reviewed” instead. 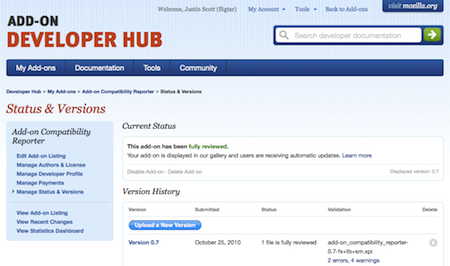 We encourage all add-on authors to try out the new Developer Tools and give us feedback. I find it interesting that Personas took priority over an Extension? As I go through all of our potential slugs, almost all are taken by Personas? This was REALLY poorly planned. There should have been some notice to add-on developers so that we could have a chance to grab our slugs. All the slugs are being grabbed by Personas. At least Facebook was nice and let people know when it was going to happen so that they could have a chance. I am happy to hear about the new review policy. I hope all the developers will like it. Now I can try more add ons. I like everything you’ve done.Good effort but the weekly downloads counting system seems to be broken. Why not venture out into this vast community and have a few people step up and see for themselves the amount of work involved in reviewing, make their contribution to the effort. I find it amazing that many are willing to be critical but when it comes to putting their contribution in, they can’t be bothered, and aren’t we ultimately the ones who are reading them?